Renowned British composer Benjamin Britten (1913-1976) believed that a musician should serve the community. He practiced his ideology in a variety of ways, through music activities organised for the local community and through founding the Aldeburgh Festival, one of Europe’s most prestigious festivals focused on classical music. Today, Britten’s legacy is continued by the Snape Maltings (formerly Aldeburgh Music), a creative campus embedded in the breathtaking fields and under the open skies of Suffolk, a county in the south east of the United Kingdom. Located in the small village of Snape and spanning across several buildings that belonged to the composer, among them the famed Concert Hall which he opened in 1967 and his studio, now a small concert hall, the Snape Maltings organisation duly continues the composer’s legacy through the many activities it pursues. Part of its mission to embrace the community is expressed with the Learning and Inclusion Department, which uses music as a tool for social engagement. This department has been in existence for about 20 years, and is deeply engrained within the Snape Maltings’ concept of how music can work within the community, how it can be useful and how it can engage with the widest group of people. The department’s website reveals that last year 28 projects took place, which included a total of 337 sessions, involving 80,451 participants, 45,310 audience members and 142 artists. The department’s activities aim at embracing the community through musical expression, which nevertheless is not imposed onto them but rather serves as a tool for reaching out to them. As such, the Snape Malting’s team works with school age children, from mainstream education to those who are in need of special programmes; it reaches out to care homes and centres taking care of the elderly or people with a variety of illnesses, such as dementia; it creates links with prison inmates. The programme also trains teachers and caregivers so the mission can be carried on after the Snape Maltings team leaves the location. 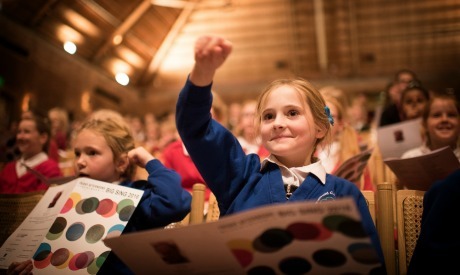 The local community is also encouraged to attend some of the activities held within the Snape Maltings’ halls. “The material we work with varies depending on the group we address. Equally we do not work with one kind of music or offer one pattern of music practice. Sometimes we pick the songs or music, at other times sometimes musicians would capitalise on the songs that the participants know already and play around them,” Callum Given, Learning and Inclusion officer explains, mentioning a few core strands of the programme. Among other target groups of the Learning and Inclusion department are prison inmates. Snape teaches them songwriting and twice a year organises a performance during which the songs are presented. “Due to our work within the prisons, there are cases that some inmates get temporary parole to join our activities at the Snape Maltings. This is a great example of how they have developed certain abilities to communicate within the community,” Woods explains. The group meets in music practice where “we care about engaging the participants on the level that works for them, even if this means that you just sit there and listen (as can be the case with people with severe dementia). It is important to be with other people, to share a positive experience; it is all about inclusion,” Woods adds. Callum Given points to yet another strand of the Learning and Inclusion department, which while working within the local community also has a wide international outreach. The programme’s name is Friday Afternoons, and it was conceived as part of the centenary celebrations of Snape Maltings in 2013. The initiative’s name references Benjamin Britten’s 12 songs that he composed for his brother Robert, the headmaster of the local Clive House School. The set of simple compositions – among them Cuckoo! and Old Abram Brown, which much later were also featured in the 2012 American film Moonrise Kingdom – were sung by the pupils on each Friday, hence their name. Today, the Snape Maltings commissions composers to write additional songs, some of them being inspired by Britten’s musical material. Not only the Snape Maltings host Friday Afternoons (though today not necessarily on this day of the week), but also encourage all international institutions and individuals to join them in singing. “All of the songs are uploaded to our Song Bank, accessible for free on our website http://www.fridayafternoonsmusic.co.uk. 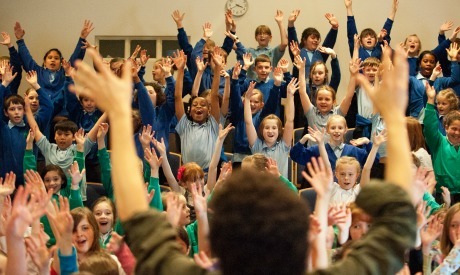 Anyone around the world can download the songs, sheet music and supporting material for teachers. While they are ready to be sung as such, we also invite the international community to adapt them to their cultures and musical preferences. If you are fascinated with Samba, make them to Samba beat. If you are used to Arabic music, you are free to add your cultural touch to them,” Given explains, adding that since its inception, Friday Afternoons had 80,000 participants, from all around the world. Yet this is not where the gems of the Friday Afternoons end. Faithful to the idea of inclusion, the department has also uploaded material that helps differently-abled children to learn music notation. Known as Figurenotes and developed by the Finnish music educators Kaarlo Uusitalo and Markku Kaikkonen, each note in the score carries a corresponding coloured symbol and the length of the note drawn corresponds to its time duration. 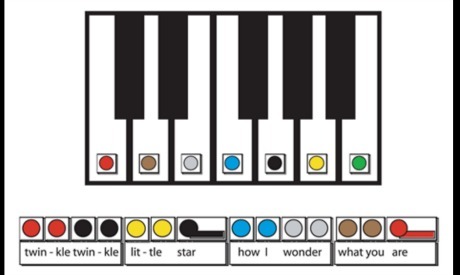 “Some children who are differently-abled cannot grasp the idea of all the black small dots representing different notes. The colours and shapes help them understand the music progression,” Given explains. The Learning and Inclusion team invites everyone around the world to benefit from the free material and register their participation on the website. The online map of the world reveals all the beneficiaries of the songs, where they span across many countries in Europe, in addition to the United States, South Africa, Australia, New Zealand, as well as China, Thailand and Malaysia. Whether it is work with the elderly, differently-abled, inmates or children, the Learning and Inclusion department of Snape Maltings creates a palpable change through music. “Music is a very important part of our life and it has multiple entry points, whether it is just tapping a small rhythm on your knee with one finger or singing with a large group. You have so many options to choose from and all of them allow you to participate and feel that you belong to the community. No better way to follow Britten’s legacy,” Woods concludes.